Facing the worst council cuts ever with the loss of over 300 jobs and vital services, Southampton Socialist Party put forward concrete proposals to the council’s budget consultation process to set a No Cuts Budget to protect all jobs and services as part of a mass campaign to force increased funding from the ConDem government. This proposal was based on utilizing council borrowing powers funded by cash in the council’s reserves. The council have now circulated a document written by Chief Financial Officer (CFO), Andy Lowe, refuting this proposal. Southampton Socialist Party does not accept the legal arguments of the CFO. They only represent one interpretation of the legislation from the Local Government Act 2003. In fact, rather than contradicting our proposals, we believe the Act, and the experiences of council borrowing since the 2003, gives avenues Southampton council must test to the full in fighting to defend the city from the draconian ConDem cuts. As the Local Government Act asserts, “A local authority may borrow money – (a) for any purpose relevant to its functions under any enactment, or (b) for the purposes of the prudent management of its financial affairs”. Can there be any doubt given the cuts the city faces that our proposal meets this requirement? The CFO actually accepts that councils can borrow, even without government permission – he could hardly do otherwise when, out of Southampton council’s General Fund borrowing (for non-housing expenditure) of £79.9m in 2011-12, £22.9m was ‘unsupported’ by government grants. He then says, however, that borrowing should only be for ‘capital expenditure’ as opposed to day-to-day ‘revenue’ spending, but that is not the whole truth. The Audit Commission, the government’s spending watch-dog, admitted recently that 16% of unitary local authorities submitted ‘capitalisation requests’ in 2012 to allow them, in the Commission’s words “to treat revenue expenditure as capital expenditure and therefore either borrow or use capital receipts to finance” it. There are other routes as well. What is ultimately deemed to be an ‘acceptable budget’ will be decided not by the views of council officials and their legal advisors alone, or even Eric Pickles, the Conservative minister for Local Government, but the determination of those councillors committed to opposing the cuts and the mass support they can build for such a stand. And can there be any doubt they would receive such support? Whilst the eight official consultation meetings in the city attracted just one hundred people, the overwhelming view was of opposition and concern at the impact the cuts would have. Elsewhere public consultations held by the community themselves and been well attended. Over 200 attended the meeting for Oaklands Pool and the same number at Newtown Youth Centre. Over 70 attended Woolston Youth Centre recently. Unanimously these meetings have called on the council not to implement the cuts. 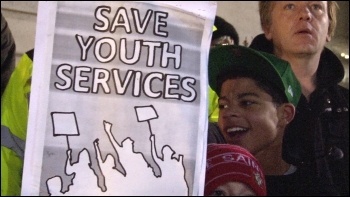 Over 1,500 signatures have been collected in support of Oaklands Pool, over 2,000 signatures in support of Southampton Youth Services. Most significantly the stand of Keith Morrell and Don Thomas to vote against cuts and support such a fight has galvanised others that such a campaign could be fought and won. They have received overwhelming support in their Coxford ward and backing from Len McCluskey, UNITE General Secretary and the RMT union. 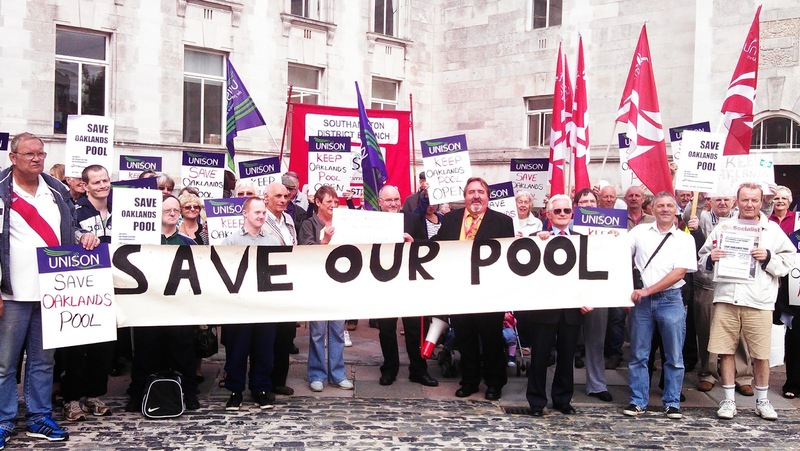 Alongside this they have received the support of Southampton council workers, their unions and trade union branches, activists and anti-cuts campaigners across the country. Meanwhile the ConDem government’s austerity agenda unravels by the day and faces growing opposition nationally. Committed to cuts as a way of reducing government borrowing, this weeks figures show the government is borrowing more than it did last year! As the impact of the cuts is felt support for the government is falling. Recognising the horror these cuts will bring, leaders of three Labour councils – Newcastle, Liverpool and Sheffield – wrote a joint statement over Christmas begging the government to change tack because “forces of social unrest are starting to smoulder”. If any council dared to defy the government it would become a beacon to the whole country given the scale of the cuts today. Millions would flock to take part in a mass campaign in support of the council. Southampton Labour council and it’s two Labour MPs, Alan Whitehead and John Denham, could easily demand that Labour promise to write off the debts of any councils that borrow in order to avoid cuts. So Labour councilors do have a choice. Surely they must all ensure no stone is left unturned in fighting to defend the city from such cruel ConDem cuts. We call on them to show some steel and leadership and refuse to implement the ConDem cuts! Join the Fight – Join the Socialists! 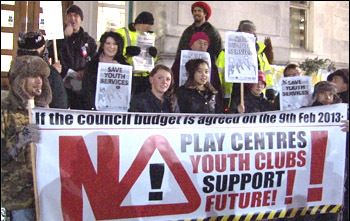 Southampton Socialist Party has consistently campaigned against all cuts. Through our work we have ensured St Mary’s Leisure Centre, Bitterne NHS Walk-In Centre and Crowlin House remain open. Fight the cuts and join the fight for socialism! Attacking our own no matter how distant they seem by cutting is not how we can ever truly oppose the government or the Tories. We need a balance here, it is true the council can borrow but it isn't a responsible thing to do, we we don't know what else is coming down the line. We need to work with the councilors none of which came into the job to impose cuts! And fight the power in London, not Southampton. Any concession there, is a real concession. A concession here where the budget doesn't work as it does in London, where spending more does mean your debt increases (Or reserves fall) and where it doesn't mean more revenue or less transfer payments. We need to join with the councilors not against them, this is what the Tories want the left infighting over this, means were not fighting them. It makes us look weak and who are we going to vote for, realistically Labour are the only ones that stands a chance, the socialists workers were laughed out the tusc weren't taken too seriously either and the rise in all these factions just allows the more united right to take control and piss on all of us! thanks for your comments as they raise some interesting points for discussion and debate. I don't think that the article posted above is attacking Southampton Labour Council per se, but it is certainly arguing for a different approach to the one they are currently taking. You say that "Borrowing isn't a responsible thing to do" and "We don't know what else is coming down the line" but in fact we have a pretty clear idea of what is in store over the next few years and the cuts package for the forthcoming financial year is just the thin end of the wedge. We are perfectly willing to work with councillors but not ina vague and undefined way. We need some clarity and idea about why we are joining together and to what end. We completely agree that the responsibility and blame lie squarely with the current government. How then to campaign and fight against their policies and win the "concessions" you mention? The idea of borrowing is an emergency, stopgap measure designed to a) maintain and preserve jobs and services at their current level and b) to provide a breathing space and opportunity for the councillors in conjuction with local authority workers, service users and the wider community to come together as one and exert maximum pressure of the government to provide adequate funding to local authorities. How do you think that Southampton Labour Council will be able to build any sort of coherent campaign and fightback if they are seen to be prepared to implement these cuts? I don't think that sotonians will trust them to do that. I don't think that the comment about factions in this context is either relevant or accurate. The Socialist Party in Southampton and nationally is keen to cooperate and work alongside anyone who is willing and prepared to get stuck in and resist what the government are doing. Rather than factionalising, we are currently playing a key role in facillitating people coming together and gaining confidence in themselves and their own sense of power.